Monongahela Books: Nautical & Maritime History -- Pirates. 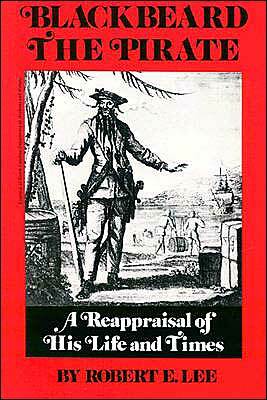 [Blackbeard], Robert E. Lee, BLACKBEARD THE PIRATE: A Reappraisal of His Life and Times. VG-/VG-. Edgewear and some small tears and creases to jacket. Original "$8.95" price on jacket flap. Previous owner's ink signature on front flyleaf. Book otherwise clean and tight. (Winston-Salem, NC: John F. Blair Publisher, 1976). Second Printing. Frontispiece portrait of Blackbeard. Extensive notes, appendices, bibliography, index, 264 pages. ~~~ Robert E. Lee, professor of law at Wake Forest University, has drawn extensively from eighteenth century letters and documents, as well as from later histories, to assemble the most thorough examination of the pirate to date. His legal background has enabled him to bring insight to such matters as the dispute over Virginia's illegal campaign against Blackbeard in North Carolina and the trial of Tobias Knight, Secretay of the Colony of North Carolina. ~~~ This book captures the reckless bravado and the dauntlessness of the pirate, one of whose greatest exploits was a blockade of Charleston, South Carolina. Yet there is also a romantic and charming side to Blackbeard, who so easily became infatuated with any attractive woman and who was entertained in the best homes. ~~~ Paperback edition currently in print at $10.95; hardcover edition OUT OF PRINT. 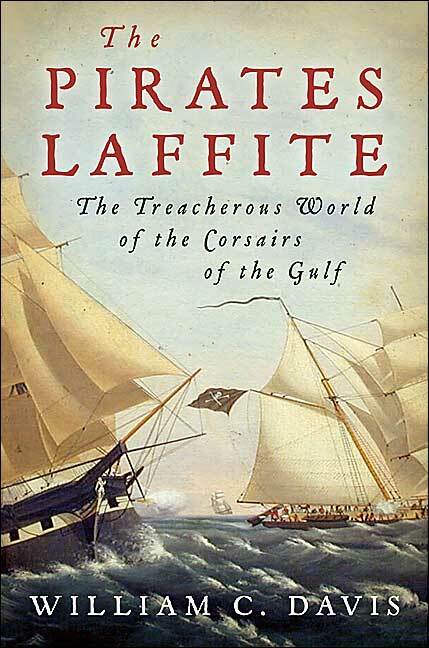 Davis, William C., THE PIRATES LAFITTE: The Treacherous World of the Corsairs of the Gulf. NEW copy, hardcover with dust jacket. (NY: Harcourt, 2005). Map on endpages. Illustrations, 157 pages of notes, extensive bibliography, index, 796 pages. ~~ From Kirkus Reviews: Prolific historian Davis (Lone Star Rising, 2004, etc. ), director of the Virginia Center for Civil War Studies, serves up a highly engaging chronicle of the brothers Laffite, anarchist princes of the early republic. Pierre moved from France to the Caribbean at the beginning of the French Revolution, perhaps motivated by sympathy to the royalist cause but also sure that there was no living to be made in the old country. He traded in whatever yielded a profit, and he acquired a sophisticated geographical knowledge of the Gulf Coast that would serve him well. A dozen years Pierre's junior, brother Jean Laffite had apparently been out at sea while Pierre set up shop in French Louisiana, but when they reunited he easily turned to a new trade, transporting and selling slaves. Their headquarters of Barataria, near New Orleans, soon sprouted a village of huts and shacks, and, with a commission from the independent republic of Cartagena in what is now Colombia, the brothers kept a flotilla of privateers busy raiding Spanish shipping throughout the Gulf. Such acts didn't bother the American administration overmuch until about the time the War of 1812 broke out, when Jean offered the governor the privateers' services against the British if the government would stop harassing them. "This plan was brilliant in its way," Davis writes, for "in effect the Laffites were offering nothing," inasmuch as their small fleet couldn't do much against the British. Andrew Jackson was receptive all the same, and the privateers fought valiantly at the Battle of New Orleans. The glory days were yet to come, for Jean soon went to work for the Spanish crown and laundered slaves in Texas for an ambitious Jim Bowie, whilePierre busied himself in similarly illicit enterprises. Pierre died in 1822, Jean the following year, "at precisely the right moments," for an independent Mexico and republican South America yielded a Spanish Main at peace and "a world they would not have known." Davis considers the Laffites to have been more entrepreneurs than pirates, ambitious but hapless, "men of temporal success but lifetime failure." A splendid telling of their endlessly interesting tale. 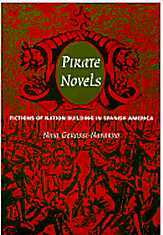 Gerassi-Navarro, Nina, PIRATE NOVELS: Fictions of Nation-building in Spanish America. NF. Trade PAPERBACK. Black remainder mark on bottom edge of book, otherwise in new condition. (Durham, NC: Duke University Press, 1999). 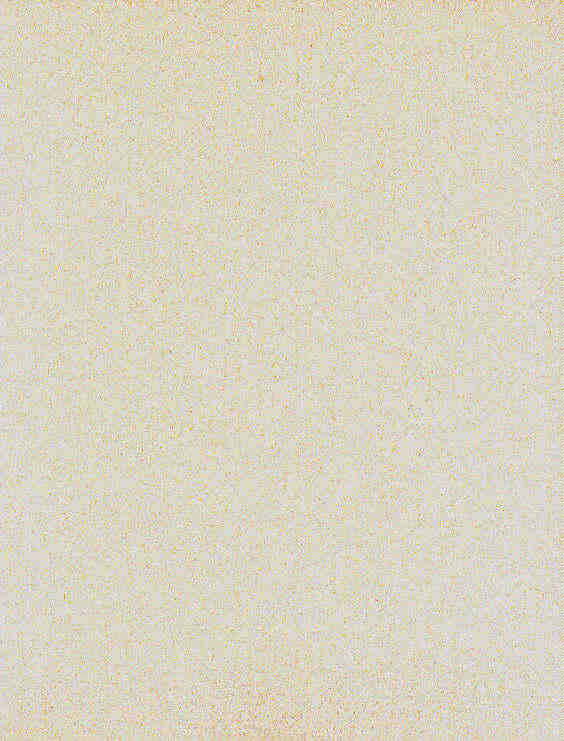 Frontispiece illustration, extensive notes, bibliography, index, 251 pages. ~~~ CONTENTS as follows: Piracy in Spanish America: a history -- The sea monsters of the colonial era -- Defining national identities through piracy -- Nation building and the historical novel -- The force of melodrama. Griffin, Nicholas, THE REQUIEM SHARK. NF. Trade PAPERBACK. Black remainder mark on top edge of book, otherwise in new condition. (NY: Berkley Books, 1999). Illustrations, 368 pages. ~~~ From Publishers Weekly: "A Treasure Island for today's adults, this rousing debut set aboard an 18th-century pirate ship tells a skillfully crafted hypnotic tale abounding in mayhem and murder. Bored with life on shore, pudgy, scholarly 19-year-old Welsh fiddler William Williams allows himself to be pressed into service on a slave-trading ship. But his real adventures begin when ruthless buccaneer Bartholomew Roberts raids the ship, taking "the music" and his nemesis, repellent pockmarked cabin boy Phineas Bunch, to round out his crew as they rove the sea lanes from Brazil to Africa's West Coast. Discovering that Williams can write, Roberts commands him to log the Rover's adventures so they can be published if the vessel is captured and Roberts killed. As time goes by, Williams becomes Roberts's right-hand man, negotiating with the officers of bested ships for crewmen and loot and altogether embracing the seafaring life. 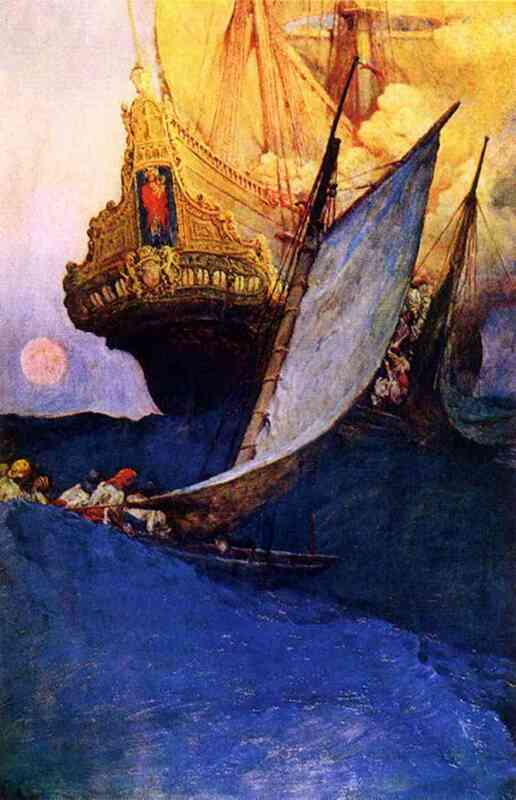 Through a host of smaller conquests, the crew of the Rover dreams of capturing the fabled Juliette, a craft laden with enough gold to usher each and every pirate into luxurious retirement. But such fantasies ultimately steer the ship astray. Inspired by a few sketchy historic tales about the real Bartholomew Roberts, Griffin brings the Rover's ragtag crew to vivid life: steamily convincing scenes set in Brazil, Devil's Island and African colonial ports are crammed with colorful characters like Pinch, Aged Q, Dr. Scudamore, Innocent. Concluding his ripping yarn with a clever triple twist, Griffin proves himself an unusually fine chronicler of high seas adventure." 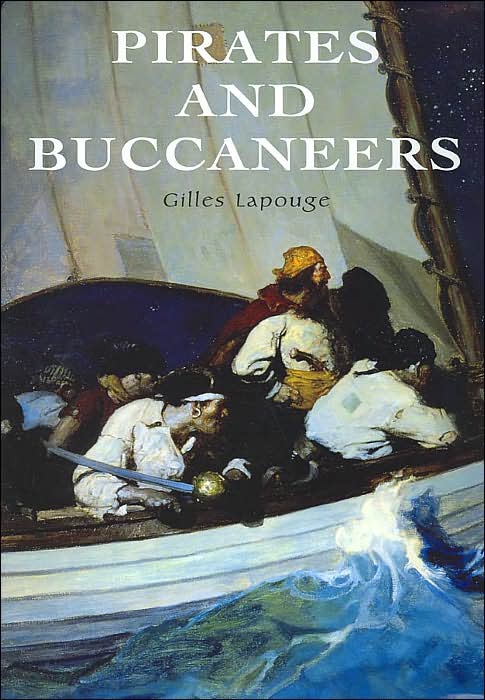 Lapouge, Gilles, PIRATES AND BUCCANEERS. Fine/VG. Half-inch tear to jacket (top front panel), and jacket price-clipped (rear flap), some rubbing to back cover of jacket. (London: Hachette Illustrated, 2002). Oversize. Import. Lavishly illustrated throughout. Bibliography. 184 pages. ~~~ CONTENTS: Towards the Promised Sea -- Dionysius, Ulysses and Thucydides -- Rome and the Brigands of Mithridates -- When America was Discovered -- Is a Corsaior a Pirate? -- The Brothers of the Coast -- Expeditions on Dry Land -- The Pirates of the Enlightenment -- Pirates under the Banner of Good -- The Dandies of Death -- Brigands, Buccaneers, Freebooters -- On the China Seas -- Death without Burial. [Morgan] Kerry Newcomb, MAD MORGAN: A Novel. NF. Hardcover with dust jacket. 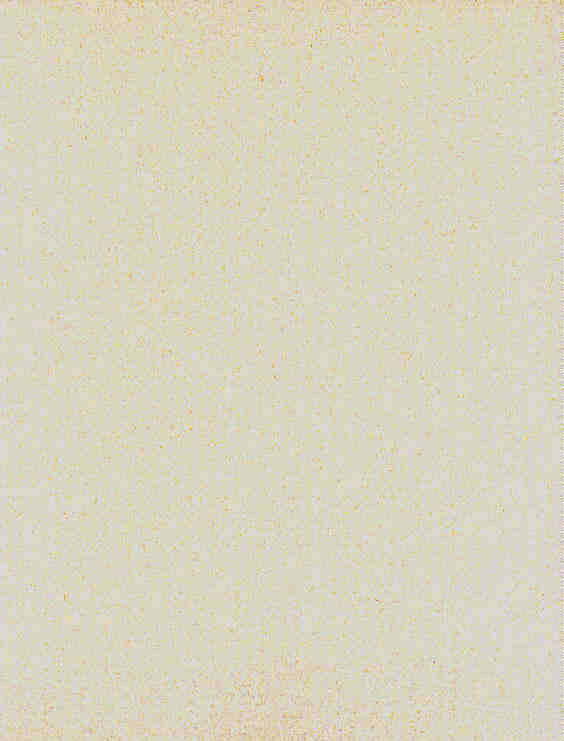 Black remainder mark on bottom edge of book, otherwise in new condition. (NY: St Martin's Press, 2000). First Edition. 276 pages. ~~~ A riveting and action-packed novel of the life and times of Henry Morgan, Mad Morgan is the legendary pirate's story told with swashbuckling romance, derring-do, and an edge as sharp as Spanish steel. ~~~ Born in the Welsh countryside in 1655, Henry Morgan is captured as a youth by Spanish raiders and carried off to Santiago de Cuba to a life of cruel servitude. Grown to manhood and unbowed by the slaver's whip, Morgan eventually escapes, stealing a prison ship and rescuing a crew of hardened freebooters in the process. With vengeance in his heart, Morgan sets out to harry the Dons. Before long, the turquoise waters of the Spanish Main run red with blood. No Spanish treasure ship or guarded port is safe--he is Captain Henry Morgan, "El Tigre de Caribe", the most feared buccaneer alive and an imposing figure of dread throughout the Caribbean. ~~ In a rousing adventure that culminates in Morgan's infamous and bloody conquest of the supposedly impregnable Spanish port of Panama City, Mad Morgan unfolds at a breathtaking pace. Rich with stunning detail, violence, passion and revenge this is a pirate tale that will captivate every armchair adventurer until the last, thrilling page is turned. 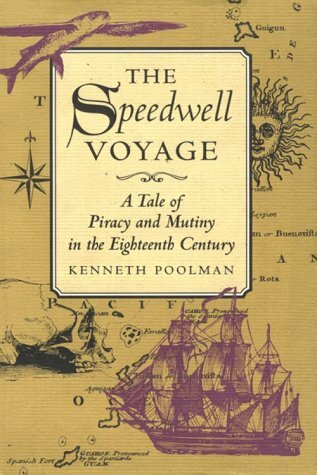 Poolman, Kenneth, THE SPEEDWELL VOYAGE: A Tale of Piracy & Mutiny in the 18th Century. NEW copy. Hardcover with dust jacket, still in shrinkwrap. (Annapolis: Naval Institute Press, 1999). 216 pages. ~~~ No mythic journey, this tale of adventure on the high seas is completely true, told by a writer who spent World War II in warships of the Royal Navy. The story is based on the real-life adventures of George Shelvocke, commander of the 22-gun privateer Speedwell that set sail in 1718 to steal treasure from Spanish ships in the South Seas. Filled with pirates, mutinies, sea battles, violent storms, and shipwrecks on exotic islands, the fast-moving narrative offers authentic details of the period and honest characterizations of real individuals. Not since Shelvocke's own book was published in 1726 has the full story been told, although Samuel Coleridge based his Rime of the Ancient Mariner on events reported by Speedwell's captain. This is the only modern attempt to recount the epic voyage. 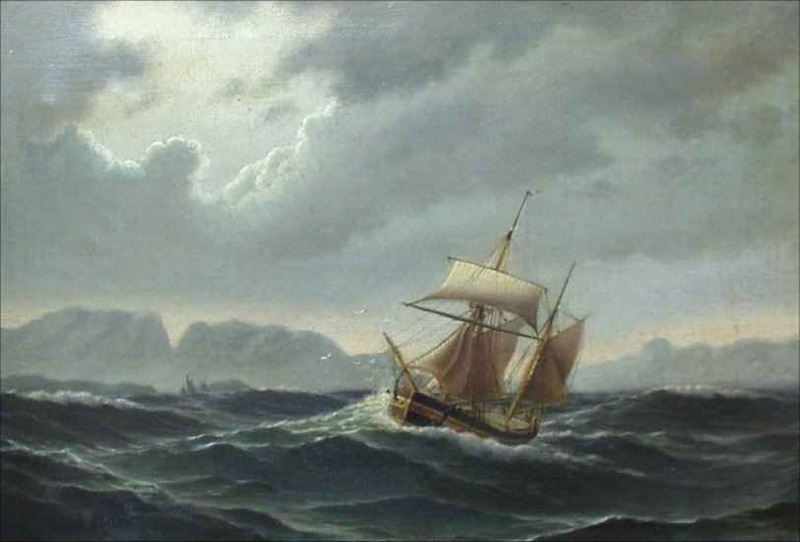 We learn how Shelvocke's seamanship skills allowed him to outfight larger Spanish warships and capture prizes but were no match for the stormy seas that claimed his frigate. We get an uncomfortably close look at the lives of the ship-wrecked survivors on a Pacific Island - the same island from which the real "Robinson Crusoe" was rescued - and we watch in fascination as the crew mutinies and forms the first sailors' soviet in history. Though not without his shortcomings, Shelvocke is shown to be a natural leader who persuades the men to build a small vessel with timber from the wreck and trees hacked from the forest. Eventually the sailors reinstate their captian and manage to take over a Spanish ship, which they sail to Macao. Shelvocke's role in getting the sick and starving men to safety is just one of the dramatic stories included in this classic sea odyssey. A richly detailed and colorful glossary ensures that readers will enjoy this tale regardless of their background. Rediker, Marcus Buford, BETWEEN THE DEVIL AND THE DEEP BLUE SEA: Merchant Seamen, Pirates and the Anglo-American Maritime World, 1700-1750. NEW copy. Hardcover with dust jacket. Cambridge University Press, 1987. 352 pages. 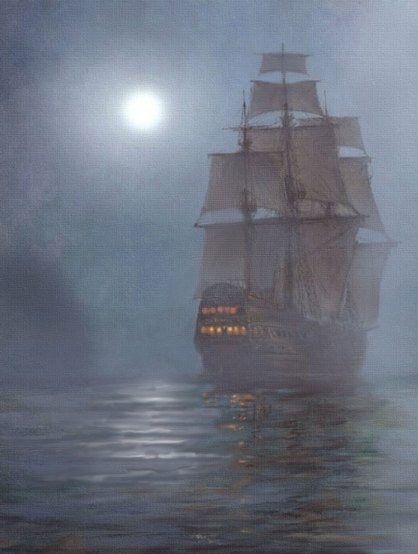 ~~~ "The common seaman and the pirate in the age of sail are romantic historical figures who occupy a special place in the popular culture of the modern age. And yet in many ways, these daring men remain little known to us. Like most other poor working people of the past, they left few first-hand accounts of their lives. But their lives are not beyond recovery. In this book, Marcus Rediker uses a huge array of historical sources (court records, diaries, travel accounts, and many others) to reconstruct the social cultural world of the Anglo-American seamen and pirates who sailed the seas in the first half of the eighteenth century. Rediker tours the sailor's North Atlantic, following seamen and their ships along the pulsing routes of trade and into rowdy port towns. He recreates life along the waterfront, where seafaring men from around the world crowded into the sailortown and its brothels, alehouses, street brawls, and city jail. His study explores the natural terror that inevitably shaped the existence of those who plied the forbidding oceans of the globe in small, brittle wooden vessels. It also treats the man-made terror--the harsh discipline, brutal floggings, and grisly hangings--that was a central fact of life at sea. Rediker surveys the commonplaces of the maritime world: the monotonous rounds of daily labor, the negotiations of wage contracts, and the bawdy singing, dancing, and tale telling that were a part of every voyage. 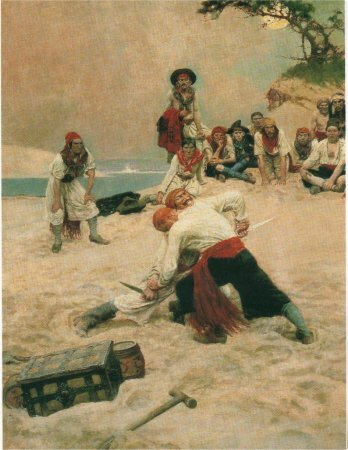 He also analyzes the dramatic moments of the sailor's existence, as Jack Tar battled wind and water during a slashing storm, as he stood by his "brother tars" in a mutiny or a strike, and as he risked his neck by joining a band of outlaws beneath the Jolly Roger, the notorious pirate flag. 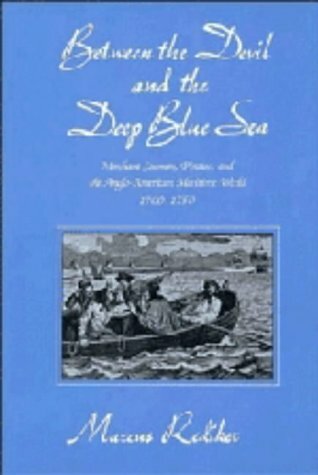 Between the Devil and the Deep Blue Sea focuses upon the seaman's experience in order to illuminate larger historical issues such as the rise of capitalism, the genesis the free wage labor, and the growth of an international working class. These epic themes were intimately bound up with everyday hopes and fears of the common seamen." 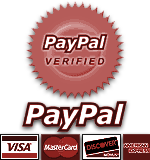 ~~~ CONTENTS: List of illustrations; Acknowledgments; Abbreviations; Introduction; 1. The seaman as man of the world: a tour of the North Atlantic, c. 1740; 2. The seaman as collective worker: the labor process at sea; 3. The seaman as wage laborer: the search for ready money; 4. The seaman as plain dealer: language and culture at sea; 5. The seaman as the �spirit of rebellion�: authority, violence, and labor discipline; 6. The seaman as pirate: plunder and social banditry at sea; Conclusion: the seaman as worker of the world; Appendices; Index. 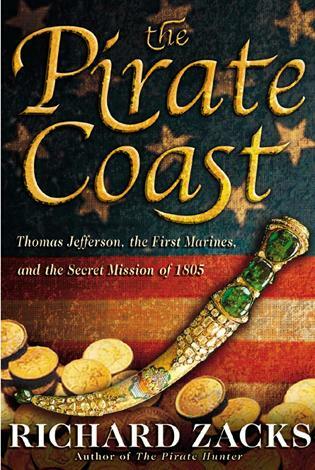 Zacks, Richard, THE PIRATE COAST: Thomas Jefferson, the First Marines, and the Secret Mission of 1805. ~~~ The declaration of war by Tripoli in 1801 marked the first foreign policy test of Thomas Jefferson's administration. Then, on Halloween of 1803, the unthinkable happened: The USS Philadelphia accidentally ran aground in Tripoli harbor and the Barbary Pirates captured three hundred U.S. sailors and Marines. The Moslem ruler renamed the frigate The Gift of Allah and held the Americans as his slaves, to be auctioned at his whim. Newspapers around the world proclaimed America's shame in headlines. Faced with this hostage crisis and an ongoing war with Tripoli, Jefferson dispatched diplomats and navy squadrons to the Mediterranean, but he also authorized a secret mission to overthrow the government there. This is the story of America's first overseas covert operation, one of the strangest, riskiest, most compelling adventures ever undertaken for love of glory and country. Jefferson chose an unlikely man to lead the operation. Forty-year-old William Eaton was a failed diplomat, deeply in debt, who had been court-martialed from the Army. He saw this mission as a last chance to redeem himself and resurrect his career. His assignment was to find an exiled prince named Hamet hiding in Egypt and convince him to mount a civil war in Tripoli. But before Eaton even departed, Jefferson grew wary of 'intermeddling' in the internal affairs of another nation and withdrew Eaton's supplies, weapons, and troops. Astoundingly, Eaton - who was forced to beg cash from British merchants - persevered and found Hamet up the Nile and lured him to Alexandria, where he rounded up a ragtag force of European mercenaries and Bedouin fighters; Eaton then borrowed eight U.S. Marines - including fiddle-playing Presley O'Bannon - and led them all on a brutal march across five hundred miles of Libyan desert to surprise attack Tripoli. After surviving sandstorms, treachery, and near-death from thirst, Eaton achieved a remarkable victory on 'the shores of Tripoli' - commemorated to this day.